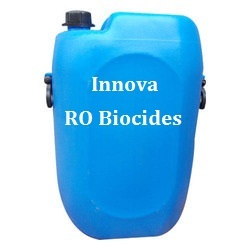 Innova Corporate (India), We are one of the leading Exporters, manufacturers in Assam, Suppliers and Dealers of RO Biocides from delhi based, we deals in finest quality of RO Biocides in Assam, manufacturers of RO Biocides, dealer of RO Biocides, suppliers of RO Biocides, RO Biocides, RO Biocides manufacturer in Assam, RO Biocides Suppliers in Assam, RO Biocides dealer. Innova Biocides is a broad spectrum, fast acting bactericide for the formulation of disinfectants and sanitisers, for use in industrial, institutional, agricultural, food, beverage and domestic applications. Applications Innova Biocides is effective in a wide range of industrial disinfection applications, promarily as a solid surface disinfectant. Applications areas include : Hospitals, Institutions, Veterinary establishments, Dairies, Milking parlours, Poultry hatcheries, Food processing plant, Breweries, Pasteuriers in canned food & beverage bottling plants, Yoghurt fermentation, Air-conditioning units, Cheese moulds, Beer glass cleaners Amount to Use Innova Biocides can be used alone or in combination with other biocides to create products for a wide range of disinfection applications. Considerable data exists which provides a measure of the intrinsic anti-microbial activity of Innova Biocides, generated via European suspension test protocols relevant to application in Food, Industrial, Domestic and Institutional Hygiene. However, it is recommended that fiels tests under practical conditions be undertaken to determine the most cost-effective dose for your application.